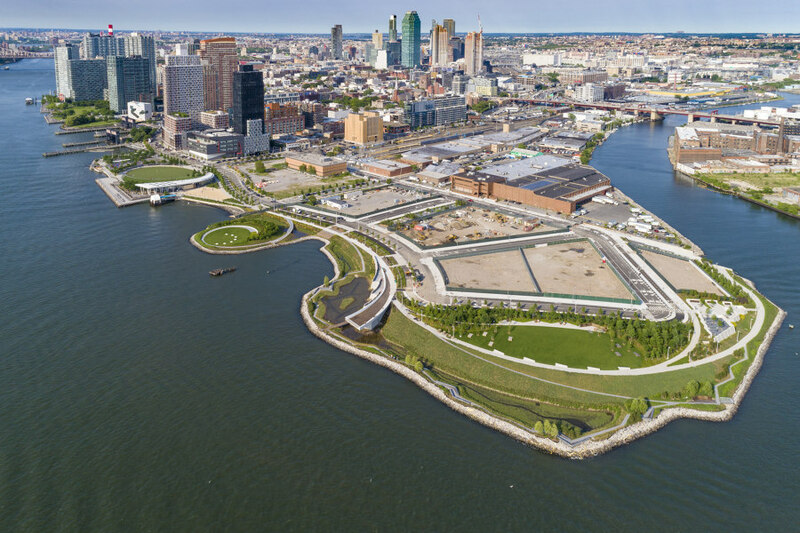 Hunter’s Point South Waterfront Park Phase II, opening summer of 2018, transforms 5.5 acres of an abandoned industrial landscape into a new waterfront park. 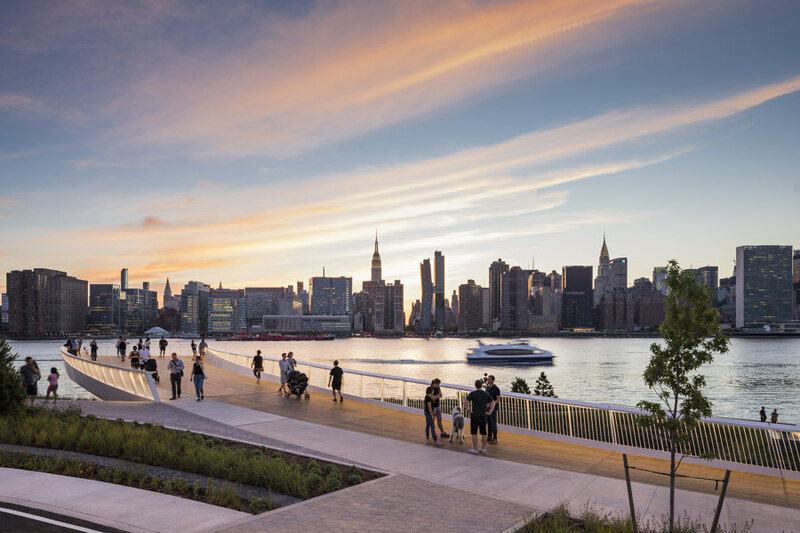 Phase II of the park begins south of 54th Avenue and wraps around Newtown Creek to complete the full vision of Hunter’s Point South Park initiated with the Phase I park, resulting in nearly 11 acres of a continuous waterfront park. 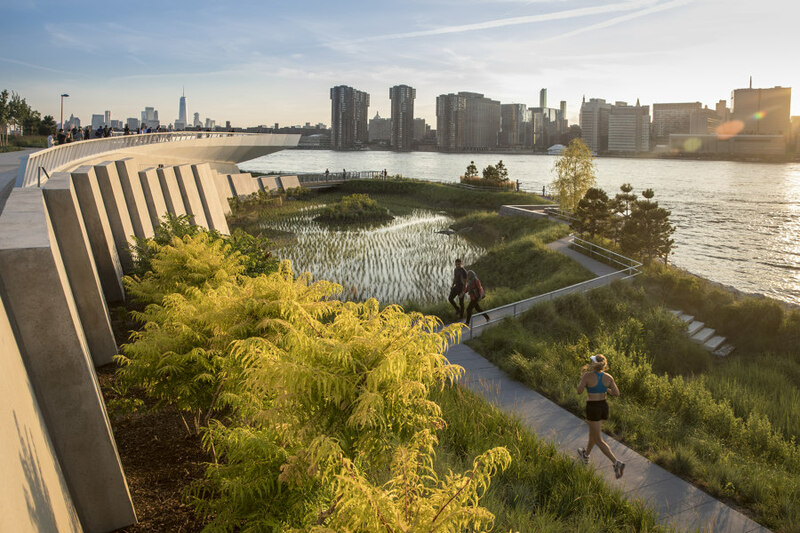 The park offers places of retreat and invites intimate connections with nature at the water’s edge, complementing the active recreation spaces in the Phase 1park. 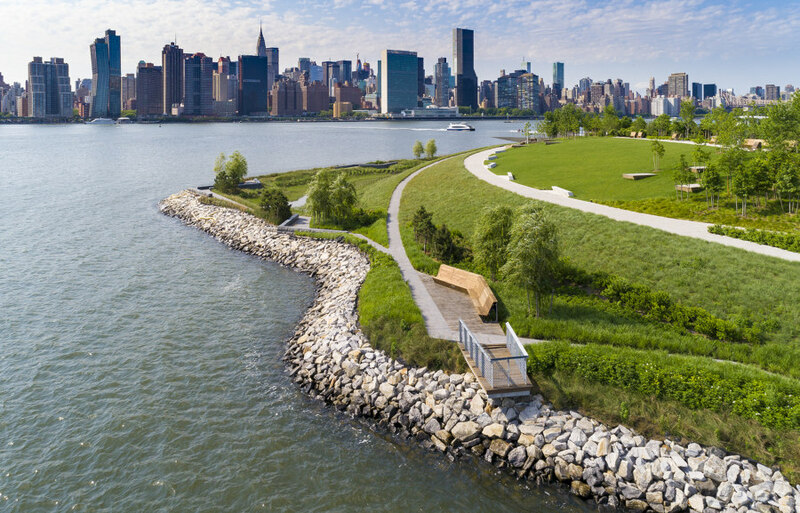 The park is also a new model for waterfront resilience, with a “soft” approach to protecting the water’s edge from floodwaters. 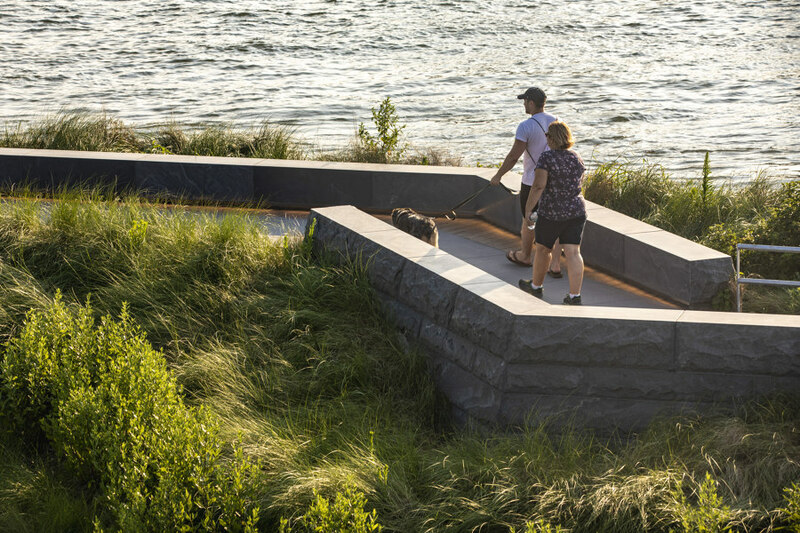 A continuous meandering causeway, elevated slightly above the river, offers a walk along the river’s edge and protects nearly 1.5 acres of newly established wetlands. 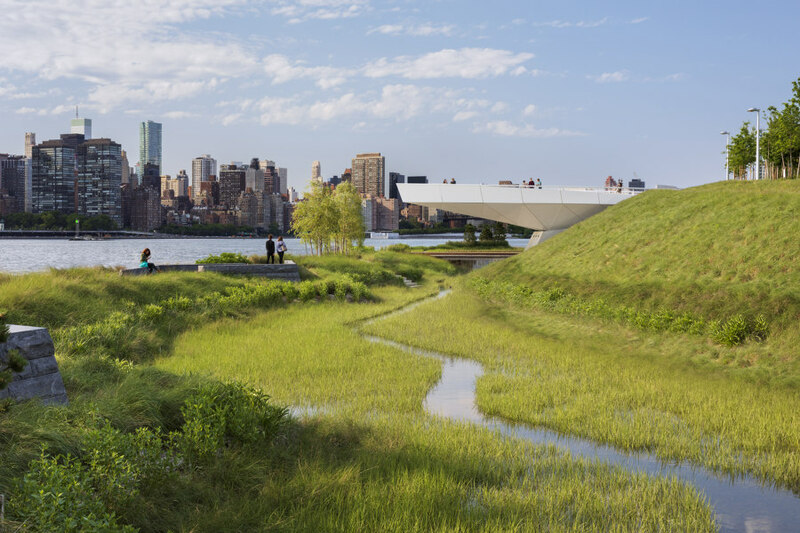 The design also leverages the site’s dramatic topography with a shaded grassy promontory, a new island reached by a pedestrian bridge, a kayak launch, exercise and picnic terraces, a collection of intimate “break-out” lounges off the pathways, and a dramatic cantilevered overlook that hovers above the wetland and offers panoramic views of the Manhattan skyline. The park was a design collaboration between SWA/BALSLEY and WEISS/MANFREDI with ARUP as the prime consultant and infrastructure designer. 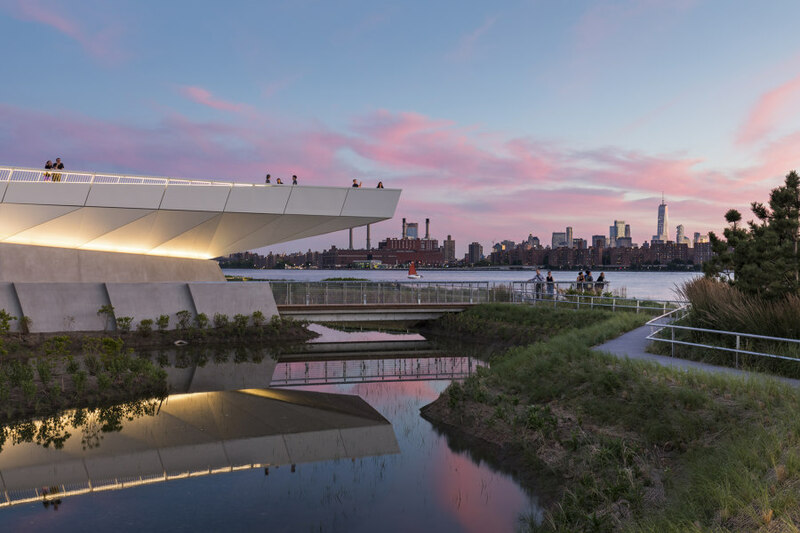 The design re-establishes the site’s former marshland identity and introduces a resilient, multi-layered recreational and cultural destination, bringing the city to the park and the park to the waterfront. 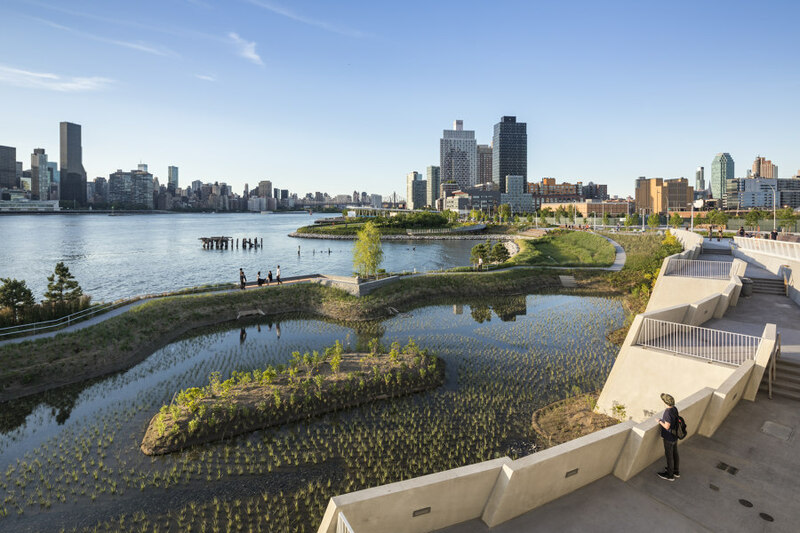 Park Entry Foyers: The park connects to the community at each cross street with entry foyers marked with distinct plantings and wood benches, and in strategic locations, extends down to the water with a wood boardwalk seating area. 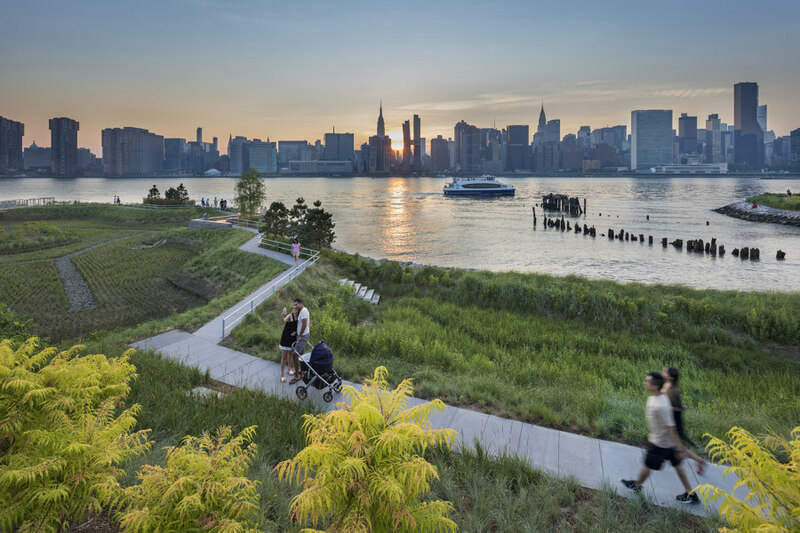 Wetlands: The park reestablishes an acre of wetlands, a nod to the site’s pre-industrial history and a contribution to the site’s resilience. With both low and high marshes planted, the new wetlands enable shoreline bank erosion control and sediment stabilization. With an expanded plant palette, the wetlands also enhance water quality and promote wildlife and fish habitation. Pedestrian Paths: From the central promenade path, new wetlands and pathways replace existing concrete bulk-heads to link the major precincts and programs of the park. This path system extends to the water’s edge and forms part of the “soft” edge infrastructure. Meandering causeways between the wetlands and river draw the community to the waterfront. 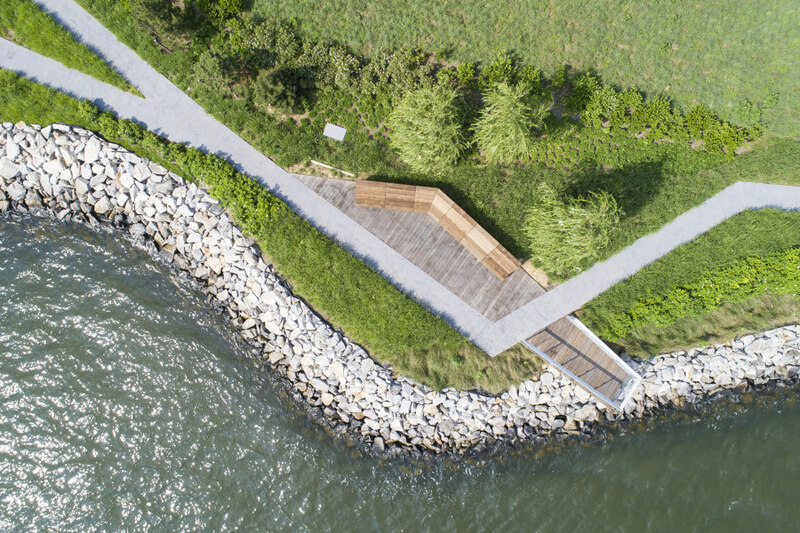 A continuous path wraps around the entire shoreline, with a several shaded moments for rest along the route, including three overlooks that reach out to the water’s edge. 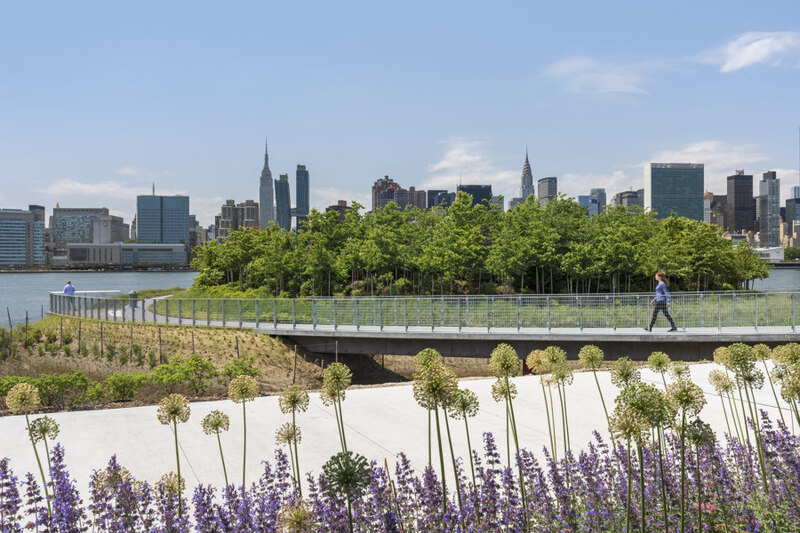 Overlook: The path that connects each park destination unfurls into an elevated promenade that extends across the wetlands to offer panoramic vistas of the Manhattan skyline and the East River. 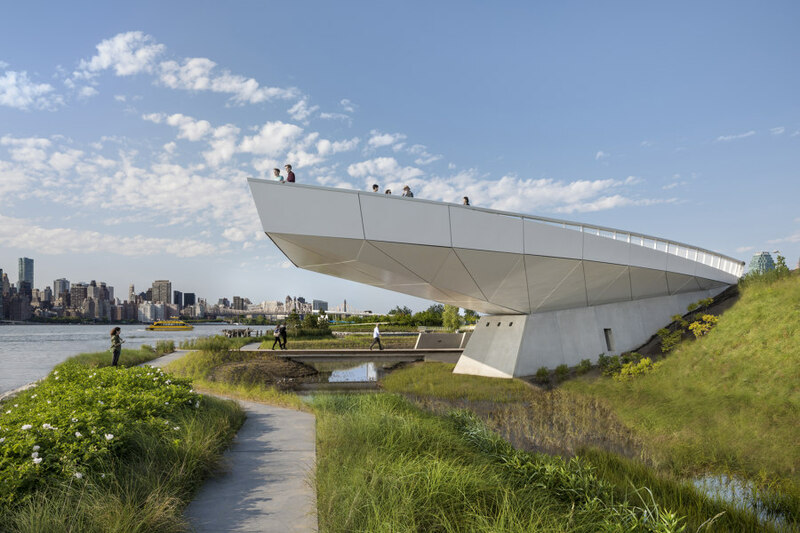 Hovering 22 feet in the air and cantilevering 50 feet beyond the edge of land, the wood boardwalk and seating above are supported by a steel structure that offers welcome shade at the stepped terraces and bridge that lead to the wetland walk at the water’s edge. At once urbane and otherworldly, it brings the city to a precipice suspended over the new wetland water’s edge. Promontory Green: The design enhances this topographic opportunity with a shade lawn grove with river views. Custom banquette seating and family “rafts” create a social space. Native bluestem grasses cover the sloping banks that frame pathways through the grassland. 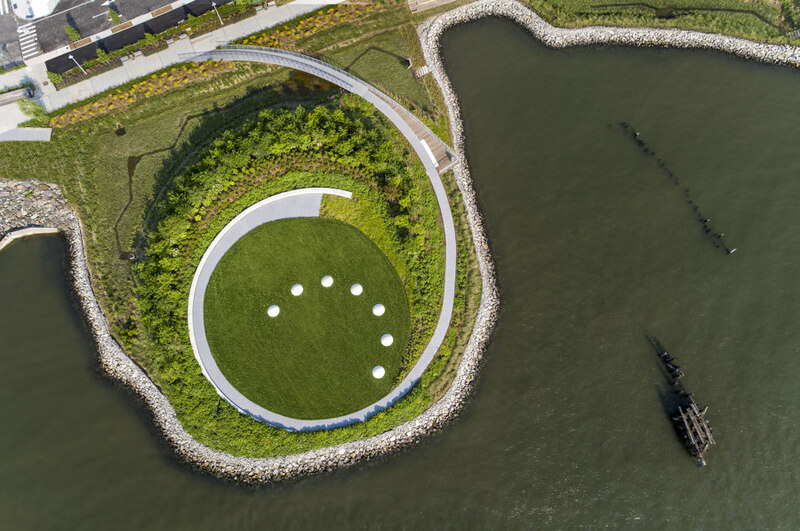 Peninsula: The design reconfigures the site’s peninsula to feel like an island. 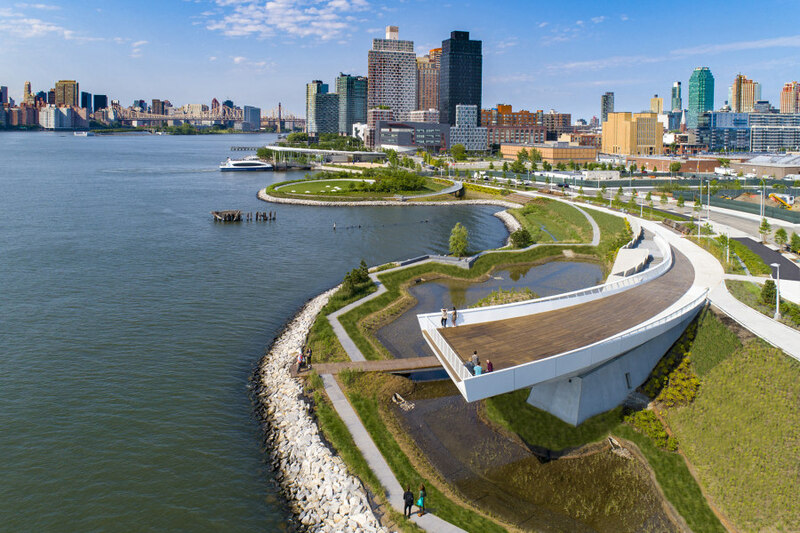 Visitors arrive on the “island” via a pedestrian bridge and wend along a continuous path that wraps its entire shoreline. New York-based artist Nobuho Nagasawa created Luminescence, a site-specific installation for the site, which presents the phases of the moon through 6-foot concrete discs that glow at night. Made from concrete and phosphorescent aggregate, the sculptures are etched to reflect the moon’s craters, mountains, and valleys. 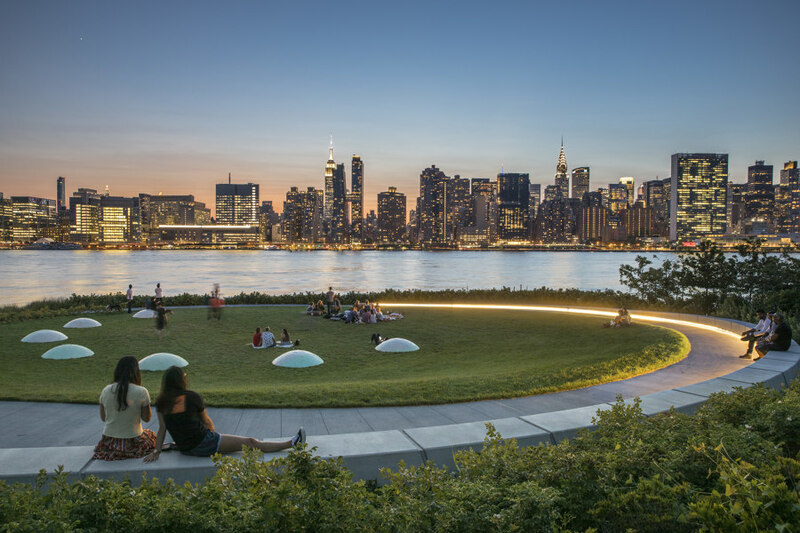 The project received an Excellence in Design award from the NYC Public Design Commission. Linear Park: The urban community park features playgrounds and landscapes and is located parallel to the future residential development parcel. The linear park also includes picnic areas and gathering spaces to enjoy the surrounding area. 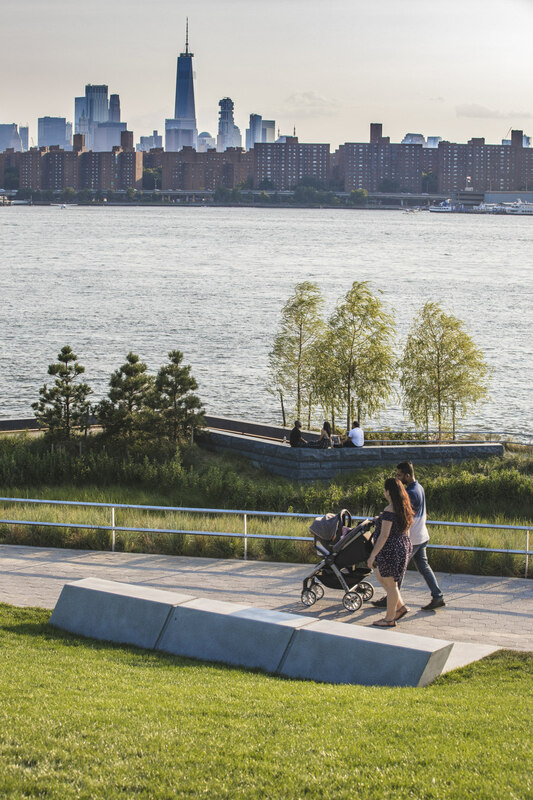 Exercise and Picnic Terraces: Three terraced spaces connect the shoreline with the street, framed by precast concrete walls, with bench seating and tree shading. The upper level includes adult fitness equipment, with picnic tables and gathering spaces at the mid and lower levels with views down the river. Kayak Launch: The Kayak Launch provides access for all types of non-motorized boating on Newtown Creek. Kayak rental and instructions will be managed by a community group. The kayak launch also includes benches and seating for onlookers. 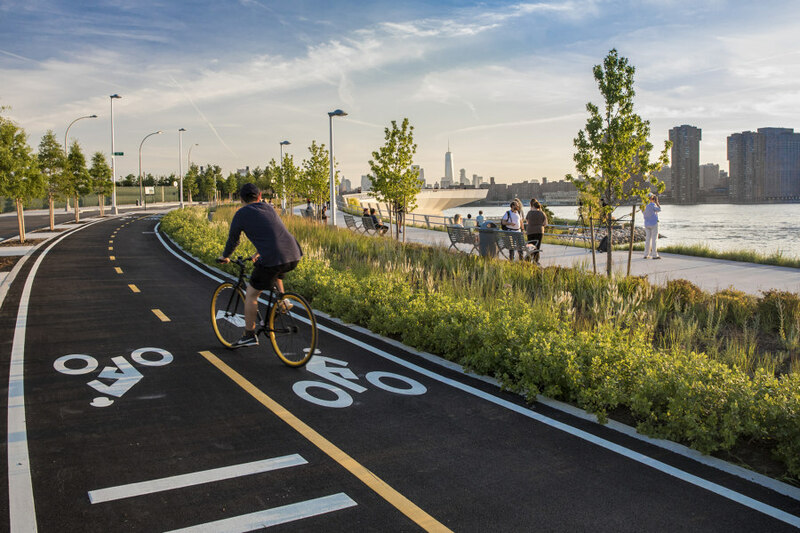 Phase 1 facts: The first phase of Hunter’s Point South Waterfront Park opened in the summer of 2013 and encompassed the transformation of 30 acres of post-industrial waterfront. 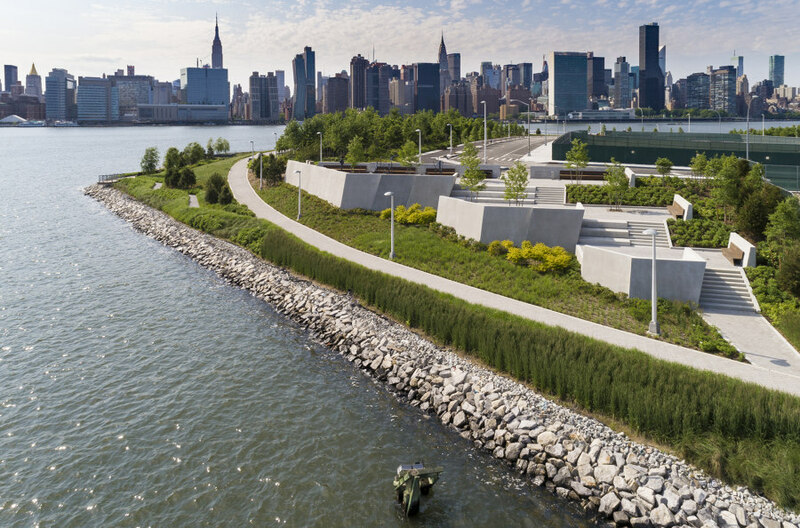 Surrounded by water on three sides, Hunter’s Point South initiating a new model of urban ecology and a laboratory for innovative sustainable design that weaves infrastructure, landscape and architecture.